CONTACT: VALERIE BROWN, ESQ., LEGISLATIVE COUNSEL, 215-933-9978, ValerieBrown95@gmail.com. Today, the New Jersey State Legislature took a major step forward toward empowering families to divorce with dignity and self-esteem, without resort to conventional litigation. The Assembly Judiciary Committee unanimously released A-1477, the New Jersey Family Collaborative Law Act. S-1224, the Senate counterpart to A-1477, was unanimously released by the Senate Judiciary Committee on March 24th and the Senate Budget Committee on June 5th. The bills have received widespread bipartisan support throughout the State Legislature, as well as the endorsement of the International Academy of Collaborative Professionals (IACP), New Jersey State Bar Association (NJSBA), New Jersey Law Revision Commission (NJLRC), and all five New Jersey Uniform Law Commissioners. 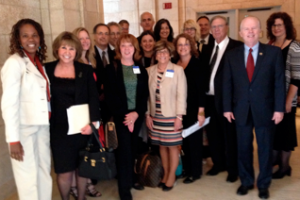 The New Jersey Council of Collaborative Practice Groups spearheaded the efforts toward passage of the act with the support of its eight practice groups, consisting of hundreds of collaboratively trained professionals throughout New Jersey. Asm. Patrick Diegnan, Esquire (D-14) (Pictured at the far right in the above photograph), the Assembly bill’s prime sponsor, strongly praised the Council’s efforts in swiftly advancing the legislation. Other Council members speaking in support of the bill included, John Caroli, CFP, Patricia Carney, Esquire, and Joesph Noto, Esquire. Jeralyn Lawrence, Esquire, Chair-Elect of NJSBA’s Family Law Section and Laura Tharney, Esquire, NJLRC Executive Director, rounded out vigorous testimony in support of the bill. The bills now head for a vote before both Houses of the State Legislature.